Blog How to fix your DOCSIS 3.0/3.1 signal Issues? Why do you need correct signal level on your modem? What are optimum signal levels for my modem? -7 dBmV to +7 dBmV are "Recommended" values. -8 dBmV to -10 dBmV / +8 dBmV to +10 dBmV are "Acceptable" values but out of spec from ISP. A technician should still fix this to get to recommended levels. -11 dBmV to -15 dBmV / +11 dBmV to +15 dBmV are "Maximum" values but out of spec from ISP. A technician should still fix this to get to recommended levels. It is strongly recommended for you to force ISP tech to fix it since your power levels are close to edge. This is how clear the signal is at the modem receiver (downstream SNR) . DOCSIS specifications list minimum CNR (carrier to noise ratio) levels not SNR levels. The SNR levels listed here are based on commonly recommended MER levels for digital cable signals. 256 QAM: 30 dB minimum. 33 dB or higher is recommended. Most ISPs run 256-QAM in downstream. 16 QAM: 18 dB minimum. 21 dB or higher recommended. It is very rare for ISP to use 16-QAM on newer DOCSIS 3.0 networks. QPSK: 12 dB minimum. 15 dB or higher recommended. It is very rare for ISP to use QPSK as performance on this modulation is very low. This is the amount of signal transmitted by the modem to reach the receiver in the cable company head-end. This is a problem in most homes and most common cause of internet disconnects. However, Upstream power levels depend on number of upstream bonded channels and type of upstream modulation (64-QAM, 16-QAM, etc). 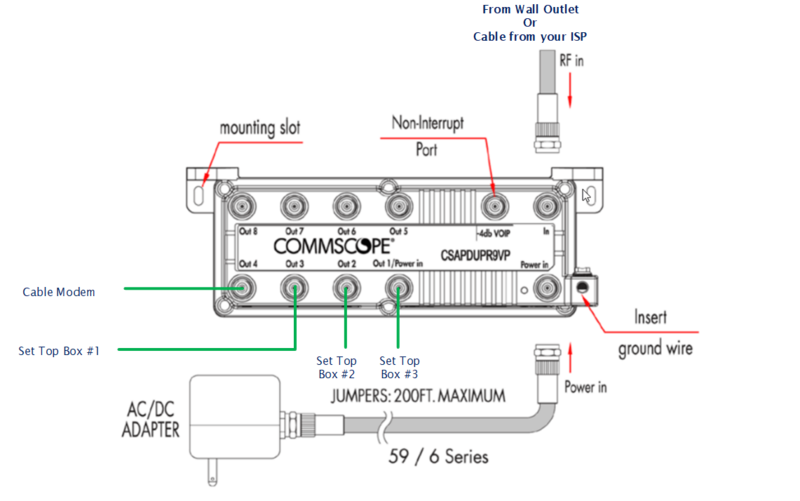 Most ISPs use either 3 or 4 bonded channels and are mostly 64-QAM. How to amplify the signal levels in your home using powered amplifier? You will need to use power amplifier splitter instead of regular 4 or 8 port splitter. These splitters have almost no signal loss and helps you to split upto 8 times for different devices such as Cable Modems, TVs, Set top boxes, etc in your home without losing any signal quality. There are 2 common models used common and here we have compared them below and also provided a connection diagram on how to install it in your home. Typical installation takes 5-10 minutes.